This species is accepted, and its native range is India to S. China and Sumatera. It is used to treat digestive system disorders and unspecified medicinal disorders and for food. Robust, acaulescent herb to 2 m. high or more; stem a swollen starchy tuber. Leaf broadly ovate in outline, peltate, cordate-sagittate, held pendent from ± erect petiole, apex obtuse, basal lobes ± rounded, primary lateral veins 6–10, prominent on lower surface, distal side veinlets of primary lateral veins arching towards margin and forming regular, parallel series. Flowering is very rare in some cultivars. 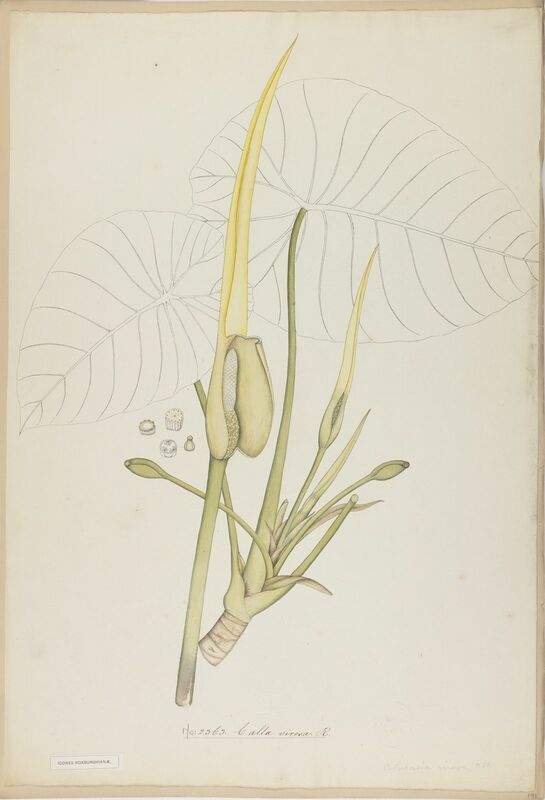 Spathe 20–30 cm. long, basal tube green, short, apical blade yellow to orange, much longer. Spadix shorter than spathe with conic, sterile appendix up to 4 cm. long (occasionally reduced or absent). Cultivated throughout the tropics for the tubers, petioles and young leaves, which are eaten after cooking. Naturalized in Uganda, Kenya and Tanzania (and throughout the tropics) in moist localities, especially highland valleys, e.g. Uganda, Ruwenzori, Eggeling 3804! Cultivada en Colombia; Alt. 5 - 2200 m.; Amazonia, Andes, Llanura del Caribe, Orinoquia, Pacífico, Valle del Cauca, Valle del Magdalena. Wild forms occur as colonies on river banks, in open swampy places, on slopes and on rocks and banks in the splash-zone of waterfalls. Very occasionally found in forest under storey (e.g., at Kerinci Seblat National Park, Sumatera). Widely cultivated usually near farmhouses or in water fields; also naturalized or perhaps native in wet places in forests, valleys, swamps, wastelands, and at watersides. 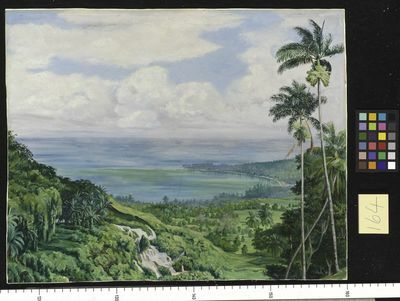 Pan tropical and pan subtropical (in areas with adequate water) through cultivation for the edible, starch-bearing rhizome and the leaves – The range prior to human distribution is unknown, but may have been widespread from Indochina to southern Japan, through Malesia and northern Australia. In Malesia: throughout. Rhizome vertical to horizontal, tuberous, 3–5cm or more (up to 15cm) in diam. Stolons long or absent. Leaves 2 or 3 or more; petiole green, 25–80cm, sheathing for 1/3–2/3 length; leaf blade adaxially matte waxy-glaucous and water-shedding (water sometimes forming “mercury droplets”), oblong-ovate to suborbicular, 13–45 × 10–35cm, base shallowly cordate (sinus 1–4cm), apex broadly and shortly cuspidate. Peduncle usually solitary, 16–26cm. 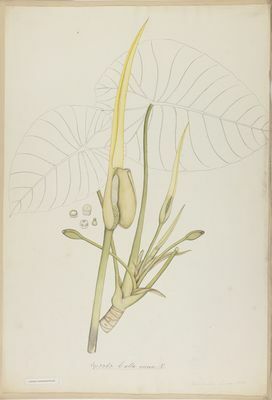 Spathe tube green, 3.5–5 × 1.2–1.5cm; limb open proximally, cream-colored to golden yellow, lanceolate or elliptic, 10–19 × 2–5cm, apex acuminate. Spadix: female zone conic, 3–3.5 × ca. 1.2cm; ovary 1–3mm in diam. ; stigma subsessile, narrower than apex of ovary; sterile zone narrowly cylindric, 3–3.3cm; sterile flowers (pistils) seen from above elongate, ca. 0.5mm in diam. ; male zone cylindric, 4–6.5cm × ca. 7mm; appendix narrowly conic, 15–45 × ca. 2mm. Berry green, ca. 4mm. Seeds few; synandria ca. 1mm high, ca. 0.8mm in diam. 2n = 26, 28, 30, 36, 38, 42, 44, 46, 48, 52, 58, 84, 116. Robust herb c. 0.8–1.8 m tall. Stem rhizomatous, condensed, usually short in wild or feral forms, though occasionally subarborescent (e.g. G. Gede Pangrango, Java), strongly stoloniferous in wild and some cultivated forms. LEAVES several; petiole c. 0.8–1.8 m long, with the sheath long, the apex usually bent horizontal (shade) or vertically down (sun) so blade often pendent; blade ovate-sagittate c. 25–90 cm long x 20–70 cm wide greenish to dark green, sometimes dark purple adaxially, pale green or glaucous abaxially; apex acute, c. 0.5 cm long; anterior lobe c. 2/3 the length of the blade; primary veins 5–7 on each side of the anterior costa, prominent abaxially and slightly raised adaxially, diverging from the midrib at 50–70°; sub marginal vein c. 0.2 cm from the margin; secondary venation flush with lamina to slightly raised abaxially; interprimary collective veins inconspicuous; posterior lobes c. 1/3 length of blade, acute, peltate for 2/3 their length, diverging at c. 40°–50°. INFLORESCENCES several together in row in the leaf axils; peduncle c. 70 cm long, down-curved in fruiting stage. Spathe varied in colour from green, yellow to orange, c. 30 cm long, constricted at level of sterile zone of the spadix; lower spathe c. 5 cm long, narrowly oblong-ovate, green; limb long, very narrowly ovate, c. 25 cm long, slightly bent, yellow to orange, deciduous or withering. Spadix stipitate, c. 13.5 cm long; female zone 3 cm long, pistils with scattered staminodes; ovary globose, green, c. 0.15 cm long, c. 0.15 cm in diam., with many ovules, placenta parietal; stigma light yellow, on short style, 1 lobed, lobes rounded; style c. 0.05 cm long; sterile interstice attenuate, c. 1 cm long, c. 6 whorls of more or less rhombo-hexagonal synandrodia; male zone c. 4 cm long, yellow; synandria irregularly rounded to rhombo-hexagonal, c. 0.15 cm long, c. 0.1 cm in diam. ; thecae flat-topped, opening through apical pores; appendix yellow, c. 5.5 cm long. Fruit a green berry, thin-walled, few seeded, ± 0.4 cm long. Fl. Feb–Apr (Yunnan), or Aug–Sep (Qin Ling area). Common Taro, Talas or Keladi. Alt. 5 - 2200 m.
The large leaves are seldom accompanied by flowers. 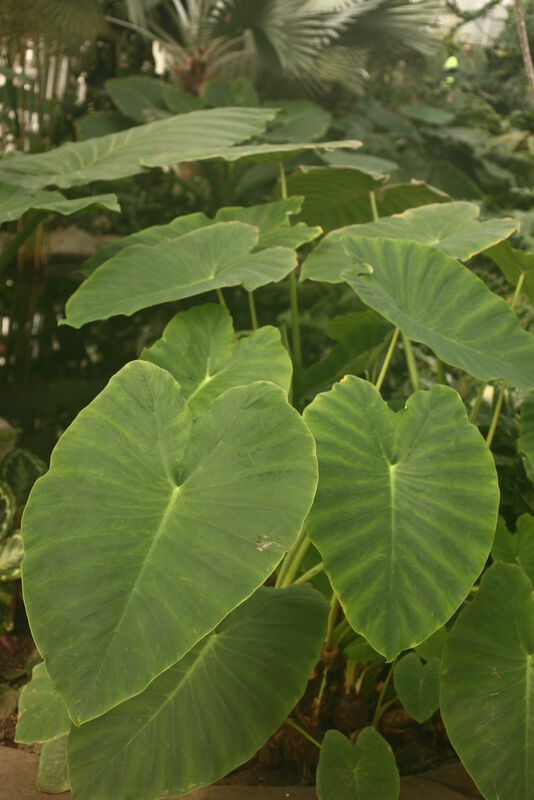 Probably originated in tropical Asia, but has been cultivated by man since ancient times (‘Taro’, ‘Eddoa’, ‘Chinese Eddoe’, ‘Mayugwa’, ‘Kalo’ or ‘Timba’). The rhizomes, petioles, and inflorescences are used as a vegetable. The rhizomes are used medicinally for treating swellings, abscesses, snake and insect bites, and swollen lymph nodes in the neck. 'Roots' - edible (Cadena-González 2010). 'Roots' - Used in liquid medicines (Cadena-González 2010). Funez, L.A. & al. (2017). Fifty-five new records of vascular plants, and other discoveries for the flora of Santa Catarina, southern Brazil Webbia; Raccolta de Scritti Botanici 72: 221-275. Gogoi, R. & Borah, S. (2013). Two new species and a new record for Colocasia (Araceae: Colocasieae) from Arunachal Pradesh, Northeast India Gardens' Bulletin Singapore 65: 27-37. Haigh, A. & Boyce, P.C. (2012). Flora Zambesiaca 12(1): 1-54. Royal Botanic Gardens, Kew. Hernandez, J. (2007). In Hawaiian rainforests: exotic aroid ecologies Aroideana 30: 91-97. Ara, H., & Abul Hassan, M. (2005). New records of three aroids from Bangladesh Bangladesh Journal of Plant Taxonomy 12: 25-32. Morton, W. Afr. Lilies & Orch. fig. 60. National Research Council (US). Panel on Underexploited Tropical Plants with Promising Economic Value, & United States. Agency for International Development. Office of Science. (1975). Underexploited Tropical Plants with Promising Economic Value: Report of an Ad Hoc Panel of the Advisory Committee on Technology Innovation, Board on Science and Technology for International Development, Commission on International Relations (Vol. 16). National Academies. Yuzammi & Hay, A. Colocasia in Araceae (Unpublished) Flora Malesiana. Nicolson in Fl. Vitiensis Nov. 1: 456 (1979). Schott, Bogner in Fl. Madag. 31: 30 (1975).